I wanted to share something that has touched me during the Easter holidays! After years of choosing to travel elsewhere for Easter, this year we have decided to go back home, and I had truly forgotten how amazing Easter in Spain can be!! I was talking to some English friends recently who were saying they were quite squeamish about blood, scary images and bodies. 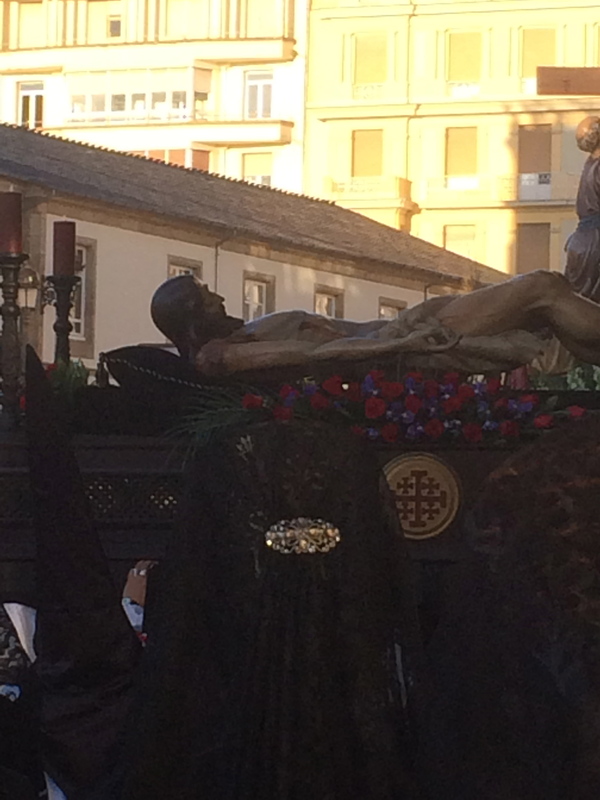 However I guess in Spain we grow up being used to looking at quite explicit images and statues of Christ on and off the cross, full of blood and in agony. The Virgins are often also visibly broken hearted and pleading. It is all quite dramatic. 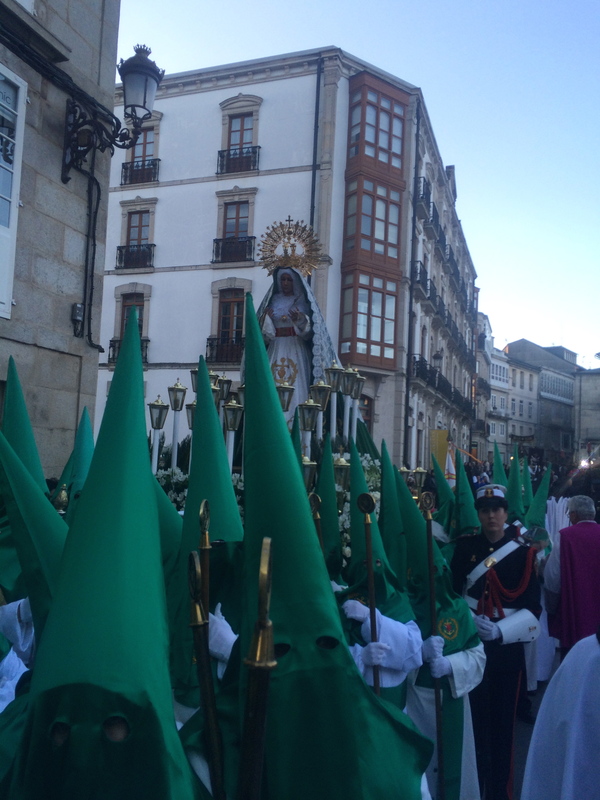 And in Easter these statues come out for a walk in processions of men and women who cover their faces with cones on their heads- los capuchinos. The cones are there to help them be closer to heaven but they do look kind of eery when you first see them. This is the first year our children have seen the Easter processions and can talk about them. They were completely amazed. They got confused about there being more than one Christ and more than one Mary and they kept there mouths open in complete surprise at the rows and rows of different coloured capuchinos depending on what church they belong to. Thankfully aside from one or two people walking without shoes despite the cold one thing has changed since I was little: I do remember the penitents walking at the end of the row wearing chains, kneeling all the way around town so their knees bled or whipping their backs as they walked to repent for their sins. I think this is still common in some places in Spain but I am glad for my children’s sake that in Galicia there is no need for drastic measures any more. I loved watching the processions, the whole town is out and peacefully either taking part and walking to the beat or watching at the sides. Some figures are dramatic some of them are beautiful; flowers, lights and silence. 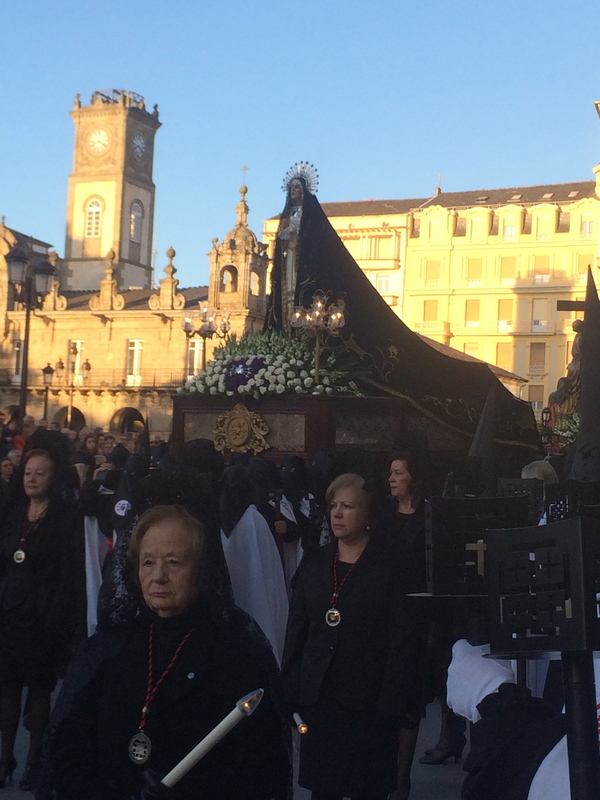 But amongst all, what my family loved seeing most is that my gorgeous, glamurous and amazing grandmother who is 84 was at the lead of the group of women who accompanied the Virgin of Dolores around our town. She looked stunning and this year I got to see how all the women get ready, the dedication they have to their church and to tradition and religion. How proud they are of themselves and their town, and how much it means to them to be out and celebrating their Virgin. My grandmother has worked to create first a school, then an independent living centre and now a third age residence for people with cognitive disabilities. Her life has been truly out of a film and she has created a beautiful space for people who at the time would have been hidden from society and fought stereotypes to make sure they were included. And now at 84 she will walk a 1000 miles and she would walk 1000 more just to be the one who walks 1000 miles to celebrate her town, her virgin and her beliefs. Ole!